In families with multiple children, a frequent parental concern is developing a healthy relationship between their children in order to promote positive individual and cooperative growth. That concern is increased when a family is faced with an autism diagnosis. You must react not only to the diagnosis, but also to the effect that the diagnosis might have on the other children in the family. Raising a child with autism while simultaneously raising a typically developing child presents challenges for the entire family. Despite these difficulties, however, there are many positive characteristics and emotions that can be fostered by the relationship between a child with autism and his or her typically developing sibling. As a parent, you have the opportunity to instill relationship-building skills, promote positive coping strategies, and constructively influence behavior. 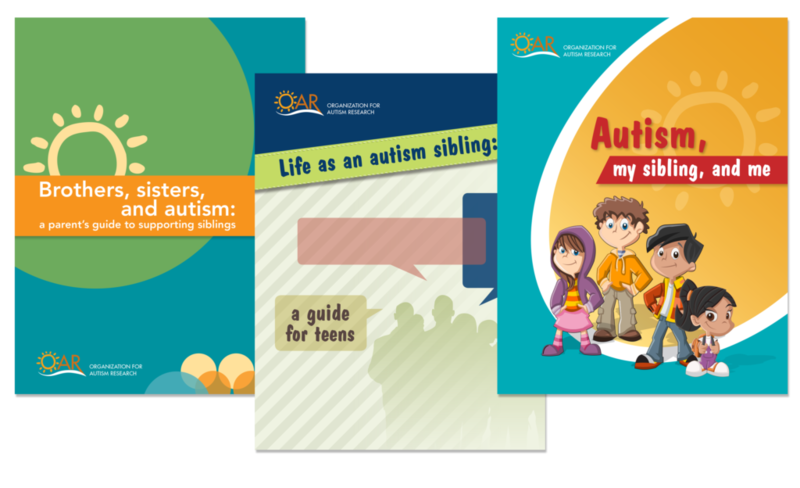 OAR offers three different sibling support resources, developed with support from autism siblings themselves, for young siblings, teenage siblings, and parents. They are available for free in hard copy or PDF format online. A child with autism often requires extra support in his day-to-day activities, and siblings frequently want to lend support. You must find a balance between asking your typically developing child (or children) to help and a reasonable expectation of what and how much that child can do. It is important to make it clear to your other children that although their roles are important and their help appreciated, they still have their own lives and are allowed to be kids. Finding this balance helps teach responsibility without overloading the child. You will likely have to dedicate a great amount of time to your child with autism in order to give them the specific supports they need. It is important that you do not become so focused on one child’s needs that you neglect the other’s. All children, regardless of age or ability, require parental guidance and attention. Although it may not be as apparent, your typically developing child has a unique set of needs that must not go unaddressed. You might try setting aside special times during the day just for them. Make a point to share special moments as well as responsibilities. It might seem impossible to provide equally for your children because of their differing needs; however, all children, regardless of ability, should be held to the same standards in the family. If your typically developing child must make her bed in the morning, so must your child with autism. If your typically developing child must wait her turn to speak when someone else is talking, so must your child with autism. This may be frustrating initially; however, behavioral therapists can help you create a routine that will benefit both children. By maintaining consistent rules, your child with autism will develop better behavior and social skills and your typically developing child will be less likely to feel resentment or jealousy. Autism can be a confusing topic for anyone, especially for siblings of children with autism. Your child may have feelings, worries, or questions that other children without their experiences may not understand. It is important to find a setting where they can interact with peers who understand what it is like to have a family member with autism. Providing them with this kind of support can help them feel less alone and empower them with coping mechanisms and information to share to promote understanding among typically developing peers. Though raising a child with autism in a family of multiple children inevitably presents some challenges, the unique circumstances and experiences you will face provide many opportunities for learning and growth. A typically developing child growing up with a sibling with autism will come to understand the meaning of patience and tolerance early and develop the capacity for sharing, empathy, leadership, and teamwork—all life skills that will serve them well in the future. The more you cultivate these skills in your home, the stronger and more supportive your family unit will be.